News and INFORMATION from Fraserburgh Harbour. The date for the next Commissioners meeting is set for Wednesday 22nd May 2019 at 1000hrs. 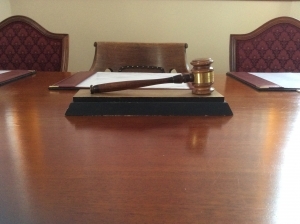 The Property and Works meeting will follow the Finance meeting. Fraserburgh Harbour Commissioners are pleased to welcome the new pelagic vessel FR229 MV Taits to Fraserburgh Harbour. A first for Fraserburgh Harbour as Fob Swath 3, a fibre glass, swath, crew transfer vessel operating in the Beatrice Offshore Wind Farm, utilised the dry dock for maintenance work during inclement weather. At the Museum of Scotland Lighthouses in Fraserburgh on Friday 26th October the Energy Minister, Paul Wheelhouse welcomed the announcement of Fraserburgh as the preferred port for operation and maintenance of the Moray East Offshore Windfarm. Jackie Simpson is presented with a long service award acknowledging 25 years of dedicated service to Fraserburgh Harbour. Thanking Mr Simpson for his service Michael Murray, Harbour Convenor presented a token of appreciation. 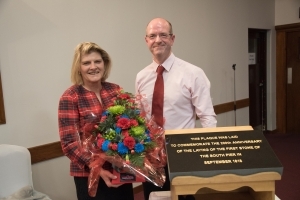 Fraserburgh Harbour Commissioners recently celebrated the 200th anniversary of the laying of the foundation stone of the South Pier and the creation of Fraserburgh Harbour Commissioners with a meal at Fraserburgh Leisure Centre. Offshore Wind first for Fraserburgh - Rix Cheetah docks at Fraserburgh Harbour Shiplift. 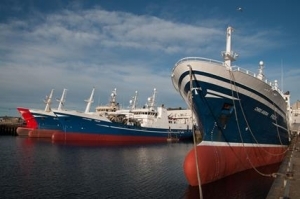 Rix Cheetah recognises the extensive and varied supply chain, with years of experience and local knowledge of the marine environment, located within the port. 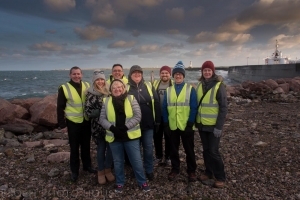 Fraserburgh Harbour Commissioners were pleased to be able to assist by allowing filming of We Don’t Talk About Love (working title Born to Run) written by local man Scott Graham. We were pleased to assist with the Cairnbulg Beach Clean up operation this year again. Fraserburgh Harbour Commissioners are pleased to welcome MV Kings Cross PD365 to Fraserburgh Harbour for the first time on 5th January 2017 to discharge fish to Lunar Freezing factory located in Balaclava Harbour. 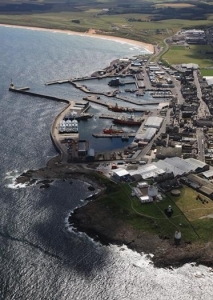 Completion of project to increase electricity supply to the wider harbour area in Fraserburgh. Vessels now utilising ship to shore power. Following notification from Department of Transport, Pre-arrival forms have been altered and new downloadable PDF is available to be used immediately. Old forms can continue to be used up to 31st March 2016. 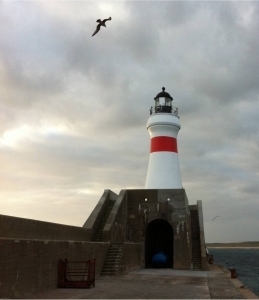 A new sector light will be operational in Fraserburgh Harbour from 1st January 2016. Please see Notice to Mariners No 8 of 2015 further details. Fishing vessels have already benefitted from the new berthing facilities following the recently completed deepening project at the North Harbour. However the arrival of the Grampian Talisman in the basin is the first visit from this type of vessel. Fraserburgh Harbour is pleased to welcome the first visiting yacht onto the new pontoon facility. We are looking to include and promote as many businesses as possible on our website. 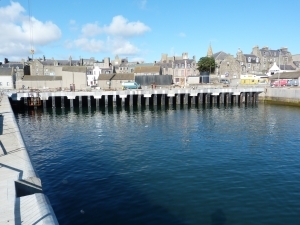 We hope you enjoy this new video of the new pontoons development at Fraserburgh Harbour.